This past Wednesday morning I mentioned to the Hayfoot that it was Remembrance Day, the anniversary of Lincoln’s Gettysburg Address. Remembrance Day, besides being an opportune time to contemplate Lincoln’s words, is a gentle reminder that the cold and early darkness will not last forever. Spring and summer will indeed return and with that will come our near-annual visit to Gettysburg. I was thinking about this again yesterday when I realized it was the 51st anniversary of the Kennedy assassination. JFK’s murder is something I have never gotten too involved in; it just seems an interminable rabbit hole. I remember living in Dallas in the mid-1990s and coming across Dealey Plaza by accident one day. This was already thirty years after Kennedy’s death and more people than you might think were out selling their pamphlets with their individual theories. For 5/10 bucks someone would take you on a guided tour. Maybe people are still doing this. 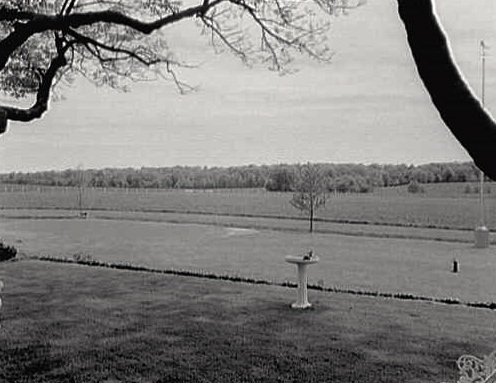 One aspect of Kennedy’s assassination that does not always occur to people is that it came three days after the 100th anniversary of the Gettysburg Address. Quite intentionally, some of the iconography of Lincoln’s funeral was incorporated into the ceremonies for Kennedy. Interestingly they had invited Kennedy to Pennsylvania but he went to Texas instead. His predecessor, Eisenhower, took his place. Eisenhower of course lived in Gettysburg and was an active part of the community. One thing that stands out in the Eisenhower parlor are the statuettes of Meade and Lee on the mantel. Dwight D. Eisenhower wrote this letter days after the Kennedy assassination and 100th anniversary of the Gettysburg Address. This past February, on Lincoln’s Birthday no less, I was doing research at the Union League Club for the Theodore Roosevelt Sr book. Nineteen sixty-three was the centennial not just of the Gettysburg Address but of the ULC as well. Roosevelt Senior and his brothers were early members of the club, which was founded in February 1863 to help Lincoln prosecute the war. This was just after Fredericksburg and the Emancipation Proclamation. Lincoln popularity was down and he needed all the help he could get. The Union League Club is something I always discuss during my tours of the Theodore Roosevelt Birthplace. I came across an interesting document. 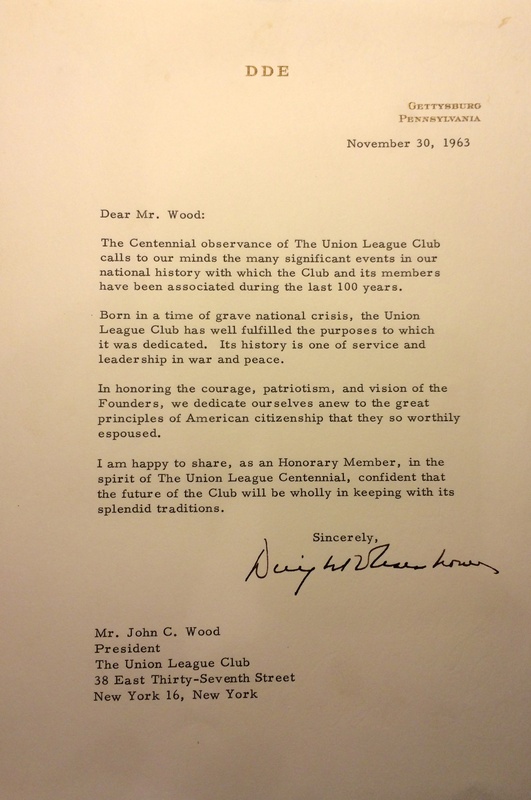 It is a letter written by Dwight Eisenhower to the leader of the Union League Club thanking him for honorary membership in the organization. Many things stand out in the letter. One of the most striking is that it was written on 30 November 1963, eight days after the Kennedy assassination. I always enjoy your blogs. I have learned so much. Jaren was born the day that JFK was assassinated . This blog means much to me. Eisenhower was the first election that found me old enough to vote. I remember it so well and how proud I was to be a voter. Grandpa was so concerned to have a military man as president. Like you I love the history at Gettysburg . Happy Thanksgiving to you dear Strawfoot and your lovely Hayfoot. Aunt Carol, thanks. That means a lot to me. Gettysburg is indeed a fascinating place. It’s interesting how every generation interprets it for its own purposes. You feel that connection when you are there. Enjoy your Thanksgiving and say hi to everyone for me.